What Colors Are Roll Up Doors Avaliable In. Roll Up Door. What Colors Are Available. Call 1-877-RLDOORS. All roll up door curtain material is hot dipped galvanized steel, primed and painted with a premium paint finish. All colors are reproduced for this chart as accurately as possible, actual material and color samples are available upon request. All colors shown are for representation purposes only. Due to the differences in the way monitors and printers portray colors, the colors swatches shown cannot be construed as an exact match. 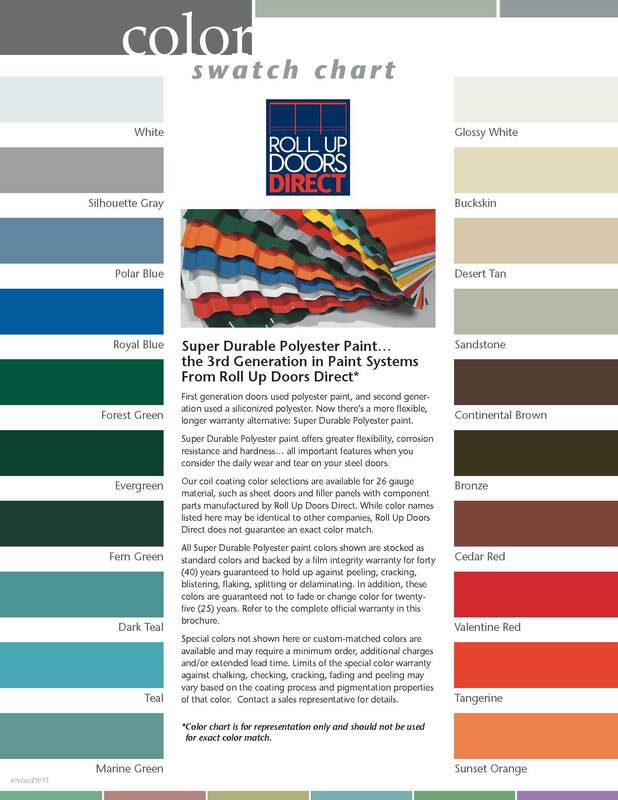 For an exact match, please contact info@buydoorsdirect.com and request a color chart for sheet doors. Effective March 2012, an upcharge will be applied to the following door colors on all door models: Patriot Red, Bronze, Polar Blue, Safety Yellow, Fern Green, Valentine Red, Uncle Bob's Yellow, Extra Green, Evergreen, Tangerine, Maroon, Light Stone and Sandstone. Please call our Inside Sales team at 1-877-357-3667 for pricing on orders of five doors or less. Models 850 and 3400 are available only in White. According to the Door & Access Systems Manufacturers Association (DASMA), "a common occurrence with rolling door products, under normal usage of such products, is the wearing away of the painted surface of the curtain. This condition occurs as the result of the curtain repeatedly coiling upon itself, and then repeatedly uncoiling, upon the opening and closing of a rolling door." Therefore, normal wear and tear from metal to metal contact is not covered under the paint warranty.